A piece of "environmental music" written by Canadian composer, R. Murray Schafer. The first production in the highly acclaimed Rhombus collection, it traces the development and performance of a piece of "environmental music" written by Canadian composer, R. Murray Schafer. 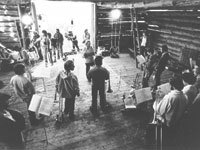 Twelve trombonists positioned around the shores of an unpopulated lake play meditative music across the water to one another at two specific times of day -- dusk and dawn. The music is cued by Mr. Schafer himself from a raft in the middle of the lake, while the natural inhabitants of the surrounding landscape respond and contribute to the music in their own way. "This gem of a production works on many different levels: as fascinating documentary, music instruction, and performance video... a marvelous videographic look at an experiment that works gloriously. This program is highly recommended for any academic or public library." "An excellent film for the music classroom for it is a fresh view of music making outside the formality and ritual of a concert hall... highly recommended for all age levels." "Not only engrossing for music lovers but should hold considerable fascination for anyone with even a casual interest in music or unspoiled wilderness." Toronto Globe & Mail. R. Murray Schafer's bizarre love story set in an old outdoor carnival. "I have never observed such a fascinating (student) reaction to a film in years... The discussion which ensued was filled with insight and profound questioning." "The film junks the weary notion that experimental music should remain the province of the stern, mirthless theorist... With its beautiful scenery, thrilling sounds and lucid presentation MUSIC FOR WILDERNESS LAKE is a strong argument for Schafer's adventurous concepts." "Not only engrossing for music lovers but should hold considerable fascination for anyone with even a casual interest in music or unspoiled wilderness."